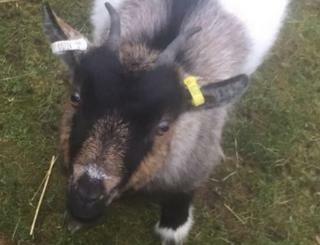 A child has written a letter to suspected thieves begging for the return of her pet pygmy goat. The EDP reported Florence Follen, five, put pen to paper to say she was "very upset" and wanted her "baby" back. Judy disappeared from her field in Brandon, Suffolk, on Tuesday. After Florence's mum, Lucy Follen, put the letter on Facebook it was shared by 1,500 people. Mrs Follen hopes the thief will see the plea and "just return Judy". The 18-month-old pygmy goat was kept in a field with four other goats at a kennels owned by Florence's grandfather on Lingheath Road. "There was no sign of entry and no way Judy could have escaped," Mrs Follen said. "It's a complete mystery, but I think they are professional goat rustlers." Mrs Follen added: "Florence is very sad. "Judy is the friendliest little goat and likes to sit on her lap and have her belly rubbed. "Florence keeps saying, 'I miss Judy', but we have hunted everywhere." Image caption Judy's owner is "devastated"